Well, lacking any evidence of psychic energy; I guess we have to go back to training the hard way. "Mastery of Hand Strength" by Brookfield. This book is a MUST for any combative program. It forms the core of EVERY combative technique you will ever use. Should the day ever come that you are fighting for your life; I PROMISE you that you will not be saying you trained your grip strength too much. ESPECIALLY if the only thing between you and death is your hand on his weapon. More importantly; we must now dispel a major myth of personal assault. To wit; that there will be time to get "set". Almost EVERY martial art teaches a set position to fire off a given technique. This may be the way you stand; the way your body is to his body; whatever. The grim reality is that wil NEVER happen in a street assault. With only a 3 to 5 second window; there is no time to set your position. Worse; setting position does NOTHING to stop the other guys attack. We have to take a principle from Gene LeBell and Wally Jay here, which is: Put them in pain NOW; keep them in pain ALWAYS. Brad just learned how well that works as he submitted a person MUCH larger and with very strong grappling skills. The simple concept of put them in pain, keep them in pain, allowed him to work his way to a win. In combatives we have to understand a simple concept. The person who attacks you has a plan. He has prasticed this plan. He is good at this plan AND he moved first so he has the advantage. Your LIFE depends on interupting his plan (read Bruce Lee on this concept); and taking the advantage by "putting him in pain and keeping him in pain". How do we do that? If we can't get our feet set striking is out. If we can't chose the position many grappling moves are out. BUT; if we train our hands to have say 195lbs of crushing force; THAT works VERY well. Think about it; personal assaults are very close encounters. The ability to crush the balls or the windpipe; or gouge out an eye instantly WILL END A FIGHT RIGHT NOW! Even if you reach down and find a cup; your grip strength will let you grab the cup; pull it out and over, then slam it home a few dozen times!!! You MUST get on the Captain of Crush program! Get the grippers; throw the bag; pinch grip the barbell plates; make up the softball lifter; etc. Your time in the weight room should be at least 50% on your grip for a combative program. This is not about looking good; it is about being VERY strong at what will win the fight. Get the book and get to work!!! BEWARE: I am NOT responsible for all the things you will break as you get used to your new gripping power! As always, Mr. Tripp, sound and excellent advice. In my wing chun school, we train the grip every single class. We start every class by training the basic wing chun stance while standing on 2x4 blocks (on their side) and simply holding big rice bags filled with rocks and with handles cut into them...very rough and they toughen the hand while your grip gets stronger. When we train our footwork, we carry these bags...about 1 or 1.5 hours total, depending on the day. Students gradually progress through heavier and heavier bags, then big buckets filled with rocks, then small cinder blocks, then large cinder blocks, and then these chunks of girder which are carried by having to grasp them in your fingertips...like a pinch. They weigh a good 30 pounds and are only about 5/8" thick...THAT takes a strong, strong grip. If I may add something that I think will help: Try a modified Farmer's walk. Take 20-30 pound weights, one in each hand, and hold them by your side BUT NOT RESING ON ANY PART OF YOUR BODY keep the weights putting pressure on your grip. now go walk 2 miles. This develops several muscle groups, but does wonders for hand strength and endurance. I wish those Captains of Crush guys took credit card orders. My wife controls the checkbook and she is a major tightwad when it comes to my training expenditures! I do the farmer's walk with 95 lbs in each hand, and the grip is the first place I feel it. This is good grip training. I must say again, I can not agree more. Every, and I mean every, person that I have met that is good at martial arts, be it wrestling to judo to striking arts, has a better than normal grip. This story is a bit personal but it drives this point home. My grandfather, who studied boxing and wrestling as a kid and Judo and jiu-jitsu after the war, was born with a birth defect in his hand. his right hand was turned complete down flat against his forearm. When he was still a baby his mother worked and massaged and made him use the hand as he got older and got into wrestling and boxing. He kept a rubber ball around at all times and I can't remeber a time when I haven't seen one next to his easy chair at home. To this day,(He's 80 years old), I rank him in the top five for my personal experiance with grip strength. His hand strength is still way above average. I think he lost maybe 7 fights, (Pro, amature and street/bar) in his life and he had many. Good piece of advice. 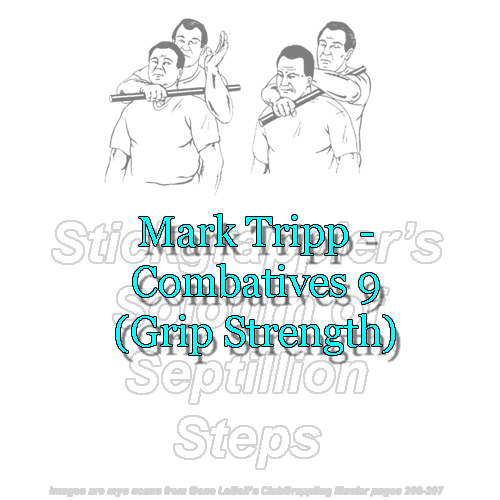 A strong grip can be a powerful weapon in its own right, as well as assisting with standard grappling techniques. The CoC grippers are great! the #1 will humble most right out of the box. I do as MTripp suggests as well and catch a bag (30 lbs of nickel plated shot in leather. Don't use un-coated lead! and in a leather bag it will last forever) and also catching a steel plate (1/4 inch about 25 lbs) between the thumb and index fingers. Finger tip pushups are very nice as a finish. Brookfeild's book is a goldmine. follow his advice and what ever you grab will stay grabbed. I've just ordered "Mastery of Hand Strength" from amazon.com. Mark, brilliant as always. You folks must try Russian nailbending! FILLED with excellent material; and when you see the guy close a #3 with TWO FIGNERS you will be humbled! He then closes a #4!!!!! They sell nails for the bending stunts; as well as enough material for training to fill your garage! Just closed a number 2 all the way last night until it "clicked". I can now close it 5 times with a little help! 2 weeks ago I couldn't close it one time. I still need to buy a number 1. I have the trainer and now the number 2. I thank coach for getting me into the "Grip strength" exersices. It helped my game alot. Grip fighting is 100X better than what it used to be...once I get a grip, It is very very very difficult to break it now. While I agree with you on the effectiveness of gripping power, I must disagree with the statement "if we can't get our feet set striking is out". This is simply not true; especially with vertically descending strikes (and several other concepts). In addition, finger jabs need very little leverage due to the nature of the blow. Great post though. A strong grip is essential to "upping the odds" when defending oneself. Then we are going to disagree and greatly so. We are not talking about a "duel" where you know the attack is coming. But clearly a suprize assault where it is happening before you have a chance to get set. If you choose to believe that a strike delivered while off ballance or worse as you are falling has a good chance of ending the fight; more power to you. I think the concept of having 195lbs plus of crushing power to be a much more sure fire way of ending the fight under the conditions I have described. We will respectfully disagree on this one. SSonnon: . You folks must try Russian nailbending! Scott you been holding out on us ;-)! At our seminar! We will HAMMER out the details later, when we can NAIL down a definite time. Boys go to your room! Boys dont make me seperate you! I'll turn this car around dammit! WOW, Machine my Dad just used to reach into the back seat and clunk me and my brothers heads together. I soon made my first strategic defesense move, I traded seats with my brother and started sitting right behind the drivers seat, in essence "taking his back" . NOTE: Posted as-of Jun 21, 2000 on Nov 22, 2013 to mirror my old archives - http://stickgrappler.tripod.com/ug/mtcombat9.html.